Who is considered a small business owner? How do I know if I am a micro business? - What are the Benefits of Registration? - - Who is considered a small business owner? - - How do I know if I am a micro business? Sole Trader under the Business Name Registration (can still employ people). Partnership: Can be done by way of a simple Agreement or under the Business Name Registration (as above). Up to 50 names can be registered under a partnership, but more than this then must register as a Limited Liability Company. Limited Liability Company under the Companies’ Act. Minimum fee to register is around GUY$30,000 plus strict company formation, auditing and reporting requirements. A Cooperative under the Cooperative Societies Act. This is a business arrangement between individuals who have voluntarily come together, pooling their financial, human and other resources to pursue common economic, social and cultural aims by means of a business and is explicitly about sharing the profits. No cost to register. A Friendly Society or Friendly Association. A group with a common interest or goal. The sole interest is not financial but this is a spin-off benefit. If assets have accumulated that benefit the members then they don’t belong to any single member but to the group as a whole. Any profits made are pooled, to develop the aims of the Society. E.G. to build an extension to a processing plant. Minimum of GUY$1,000 to register. Note: Friendly Societies are not always recognized legal business entities in terms of accessing bank finance. 1. Approach the Deeds Registry (Ministry of Legal Affairs) in your respective business district. A list of the Deeds Registry Offices in Guyana is in Appendix 1. 2. Ensure you have a name for the business and an address to fill out on the application form. 4. Currently, a registration fee of G$6,500.00 will be charged for first-time registration and G$ 2,500.00 for annual renewal. 5. Process time— five working days. 1. Approach any Guyana Revenue Authority (GRA) office in your respective business district. A list of the Deeds Registry Offices in Guyana is in Appendix 1. 3. Uplift application form, complete and return to GRA Office. 1. Approach the NIS office (Ministry of Finance) in your respective business district. Available, ID card and monthly receipts of your business if self-employed or most recent pay slips if last in employment. 3. Uplift form and complete. NIS or SBB officers can guide you to fill out the form. NB: There is no cost for registration and the process takes 3—4 working days. If you are an employee and the owner of a Small Business, you are required to register as an employee as well as an employer. There is one additional Step if the business is of a type that requires a license to operate (e.g. Fast Food Outlet, Restaurant, Cigarette or Liquor Retailer, Lottery store or Retail Shop etc.). Approved building plan from Mayor and City Council. Sanitary letter from NDC or Mayor and City Council. Letter of approval from the Guyana Fire Service. Identification Card & Tax Identification number (TIN). It costs GY $5,000.00; this varies according to the location of the business. One of the advantages of registering with the SBB is that as an ‘approved small business’ you will benefit from the Government procurement opportunities. 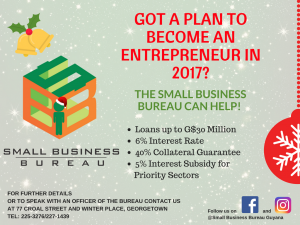 Section 2 (11) (1) of the Small Business Act requires that Government procures at least twenty percent (20%) of goods and services annually from small businesses. 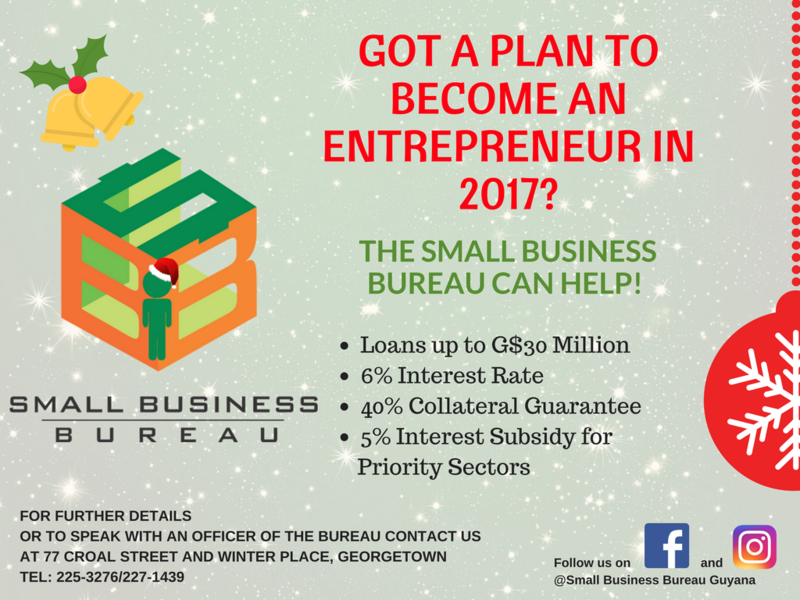 The Small Business Bureau is tasked with drafting and implementing a Small Business Procurement Program (SBPP) which will facilitate the 20% procurement. Plan to become an Entrepreneur?